COLUMBIA, South Carolina – Texas A&M captured the SEC Outdoor Championship men’s team title with 119 points, 81 of which were accumulated on the third and final day of the conference meet held at Cregger Track on the University of South Carolina campus. 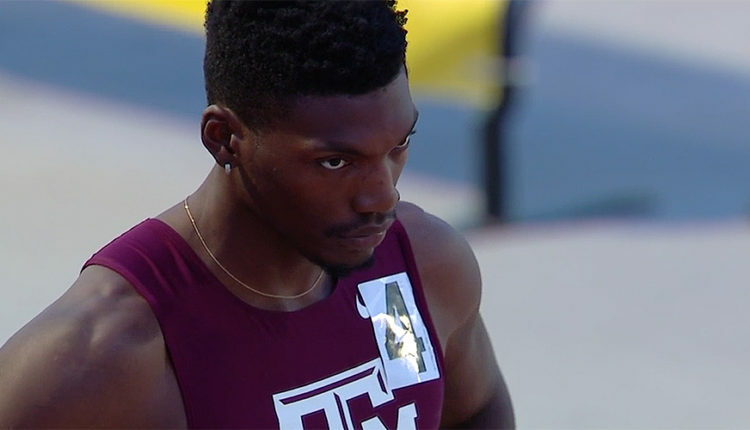 Victories for the Aggie men on the final day included Fred Kerley in the 400m, Devin Dixon in the 800m, Audie Wyatt in the pole vault and the 4×400 relay as those four wins accounted for 40 points. “This is a huge accomplishment for this group,” said Texas A&M head coach Pat Henry. “But this is just one achievement among other things they are trying to accomplish. This group is trying to become the national champions, and this is a great step in that direction. In winning its second SEC outdoor team title since joining the conference five years ago, Texas A&M produced its second highest total of points in the process. The Aggie men won the 2014 team title with 155.5 points. With 119 points Texas A&M defeated defending champion Arkansas, who finished runner-up with 106 points. Alabama placed third at 103 with Florida fourth with 81.5 points and they were followed by Georgia (75), Mississippi (67), LSU (57), South Carolina (46), Auburn (45.5), Tennessee (45.5), Kentucky (31.5), Missouri (28) and Mississippi State (14). On the women’s side Arkansas won the league title for a fourth consecutive year, totaling 127 points. LSU scored 100 as runner-up while Kentucky placed third with 80. Rounding out the top six were Georgia (77), Florida (76) and Texas A&M (72). Only eight points separated places third through sixth. The rest of the women’s team scoring included Alabama (57), Mississippi (46.5), Missouri (46), Auburn (42), South Carolina (31), Tennessee (27), Mississippi State (24) and Vanderbilt (13.5). The Aggie women produced an individual win with Jazmine Fray in the 800m and had a relay victory in the 4×400 to close out the meet. Texas A&M also finished runner-up in the 4×100 relay, produced 15 points in the javelin with a 3-4-6-8 finish led by Audrey Malone, and had a third-place result in the discus from Serena Brown. Rain during the early portion of Saturday’s meet didn’t dampen the Aggies drive for points. Jeffrey Prothro moved from sixth to first place on his last triple jump attempt, which measured 52-6w. “I always pride myself on being resilient,” noted Prothro. “With the conditions what they were, I just wanted to stick with it. The Aggies then placed fourth in the men’s 4×100 relay in 39.21 behind LSU (38.71), Arkansas (39.02) and Florida (39.20). Alex Riba picked up a pair of points in the 1,500 as he placed seventh in 3:55.05. Fred Kerley posted a 44.30 victory in the 400m, while his brother, Mylik, placed fifth in 45.60. After Fred clocked a world-leading 44.09 in the prelims the night before, he ran the second-fastest time in school history and the seventh-fastest collegiate performance to secure the win. Finishing behind Kerley were a pair of freshman from Auburn, Nathon Allen (44.52) and Akeem Bloomfield (44.81), with Michael Cherry of LSU (45.09) in fourth. Dixon moved past Florida’s Andres Arroyo in the homestretch of the 800m and clocked 1:45.71 for the win as teammate JaQwae Ellison grabbed a point in eighth place at 1:48.97. Dixon, who was clipped from behind during the SEC Indoor 800m final, becomes the No. 2 performer with the No. 3 performance on the Aggie all-time list and is currently fourth among all collegians this season. Arroyo finished in 1:46.14 for second while Craig Engels of Mississippi claimed third in 1:46.93. Another Aggie combo delivered points in the 400m hurdles as career best times for Robert Grant and Ilolo Izu placed them third and sixth. Grant clocked 49.15, just a tenth of a second away from the Texas A&M school record of 49.05 set in 1987, in finishing behind Kemar Mowatt of Arkansas (48.79) and Florida’s Eric Futch (48.82) as Izu ran 51.34. The earlier rain created a delay for the start of the pole vault. When the event ended, just prior to the 4×400 relay, the Aggies had 22 extra points. Wyatt won at 17-5 ½ (5.32) as Carl Johansson tied for second and Jacob Wooten placed fourth when each cleared 17-1 ½ (5.22). Going into the final event, Texas A&M had 109 points with Arkansas at 103 and Alabama in third with 97. Winning with a world-leading time of 3:00.72, the fourth-fastest performance ever at Texas A&M, locked down the team championship for the Aggie men. Texas A&M’s foursome on the relay included Richard Rose, Fred Kerley, Robert Grant and Mylik Kerley. Auburn (3:02.10) led the chase pack as runner-up with Alabama (3:02.75), LSU (3:02.84), Florida (3:03.08) following. Arkansas (3:03.83) placed sixth in the race. Fray posted a time of 2:02.00 to run away with the women’s 800m title after she covered the first 400m in 58.83 to put a gap on the field. LSU’s Ruby Stauber finished second in 2:03.95 while Vanderbilt’s Courtney Clayton had a 2:04.12 in third. Fray’s time is the No. 2 performance at Texas A&M behind her school record of 2:01.43 from this season. Fray later split 52.39 as third leg of the Aggie 4×400 and Jaevin Reed closed with a 51.92 on the anchor leg for a 3:29.83 victory. The first two legs were supplied by Briyahna Desrosiers and Kadecia Baird. Finish behind Texas A&M were Florida (3:30.65), Alabama (3:30.94) and LSU (3:31.08). In the open 400m, Desrosiers (54.28) and Baird (54.30) placed seventh and eighth, while Reed was disqualified. A very competitive women’s javelin produced a 191-0 (58.23) for Rebeka Wales of LSU with Florida’s Marja Vucenovic runner-up at 183-6 (55.93). Audrey Malone finished third with a 181-6 (55.33) while teammate Madalaine Stulce hit a career best of 181-5 (55.31), which is No. 4 all-time at Texas A&M, to place fourth. Additional Aggie points came from Kristen Clark (171-6) in sixth and Shelby Poncik (162-11) in eighth place. Serena Brown, who competed in the discus during the bulk of the rain, produced her best throw in the first round and her 170-7 (52.01) placed her third behind a 185-7 (56.58) by Missouri’s Gabi Jacobs and a 179-0 (54.57) for Janeah Stewart of Mississippi. In the 4×100 relay, won by LSU in a meet record 42.56, the Aggie quartet of Diamond Spaulding, Jaevin Reed, Brenessa Thompson and Aaliyah Brown, posted a time of 43.31 for second place ahead of Auburn (43.35), Kentucky (43.49) and Florida (43.96). LSU bettered the meet record of 42.61 set by Texas A&M in 2015. Among the sprint finals, the Aggie tandem of Thompson (11.29) and Brown (11.29) placed sixth and seventh in the 100m as they were separated by 0.006 to determine their respective finish. Brown (23.16) led three Texas A&M sprinter in the 200m as they finished 6-7-8 with Thompson (23.19) and Spaulding (23.37). Kara Erickson cleared 5-7 (1.70) amid an inclement high jump for 10th place. Jeff Bartlett placed 10th in the shot put with a mark of 54-10 ¾ (16.73). Distance events included Kelsie Warren clocking 16:39.20, No. 8 all-time at Texas A&M, for 12th place in the women’s 5,000m. On the men’s side Austin Wells finished 12th in 14:15.04 with Cameron Villarreal 13th at 14:15.53.